Don’t miss a great opportunity to hear three of the UK’s leading LGBT choirs in one show. 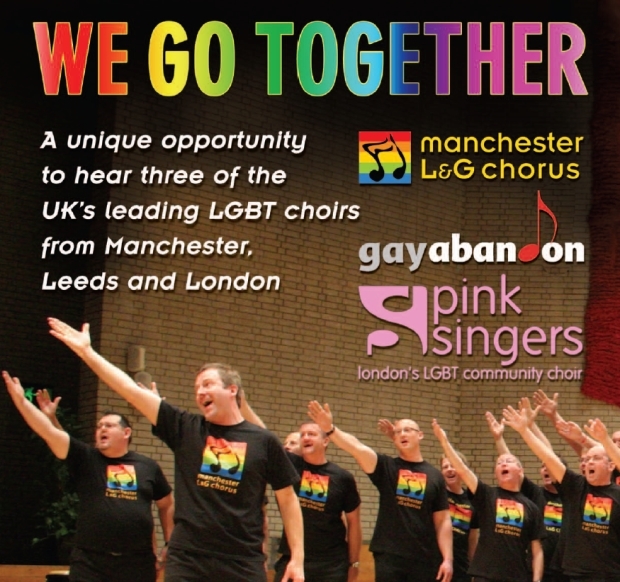 The Pink Singers will be joining forces with the Manchester Lesbian & Gay Chorus and Gay Abandon from Leeds to present ‘We go together’ later this month. It promises to be a memorable evening. There’ll be a bit of classical, a bit of soul and a bit of Cole Porter: some traditional folk, some musical theatre and one or two old favourites. You can catch the three choirs at The Dancehouse Theatre, 10 Oxford Road, Manchester M1 5QA at 7.30 pm, Saturday 20 November. The Dancehouse Theatre is the centrepiece of a complex that is home to the Northern Ballet School. It was restored to its Art Deco splendour in the 1990s and can be found in the university area not far from the city centre. Do come if you’re in Manchester. It’s a great place for a weekend mini-break. The city has been transformed over the past twenty years and there’s a vibrancy , with lots to see and do – not least the pulsating gay nightlife centred on Canal Street. You can head over there after the show – and might just bump into a few Pinkies!